My Blog Is Boring: I wish I could get paid to bake. I wish I could get paid to bake. And for the first time in my life, I put down my unfinished dessert and declared it too sweet to finish. Of course, I went back to it 20 minutes later to finish it off, but whatever. Get paid to bake? As in do it every day? That sounds like my nightmare. But I do love peach cobbler! Yum. That looks truly excellent. 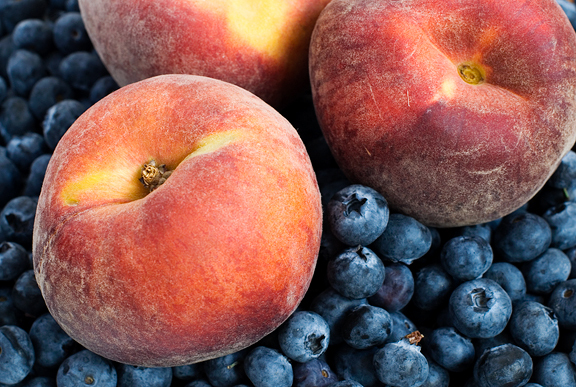 Love that you added blue berries...sounds like my kind of peach cobbler. I think my scale is a broken liar. Off to a great start - and then the crash came. Holy crap the sun's not even up yet! Love, if today is opposite day. I'd like to take another day off, please. I just wanted to sleep a little.